Read the label of the pool shock closely! All you want to use for this is high concentration of Granular Calcium Hypochlorite and nothing else. 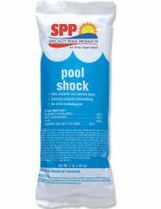 Be careful to avoid the multi-function pool shocks that have chemicals like algicides and other 'multi function 4-in-1' products. All you want is Calcium Hypochlorite at 65% or stronger. Don't worry about the ingredients listed as 'other' those are the inert parts to keep the concentrations down to where they want them. So long as no other chemical is specifically listed then its OK.
Now you have made two gallons of normal household bleach that you can use for anything you would normally use bleach for like cleaning, disinfecting etc.